Who says NASA has trouble getting anything launched these days? Why, they just launched a Facebook trivia game. 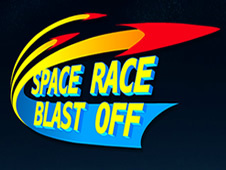 Space Race Blastoff scores correct answers to questions about NASA history, technology, science and pop culture. It’s a multiplayer game that can also be played solo. Successful participants win virtual badges. Players select an avatar and then face 10 crossfire questions. Each correct answer earns 100 points, with a 20-point bonus to the player who answers first. The winner advances to the bonus round to answer one additional question for more points. Answering the bonus question earns the player a badge, which may depict an astronaut, a spacecraft, a planet or other person or object. Additional badges can be obtained for 1,500 points. This entry was posted in Deep Space 770 and tagged NASA by Mike Glyer. Bookmark the permalink.